The Edge GS 1x20 is equipped with an energy-conserving wide-angled short-range IR illuminator. 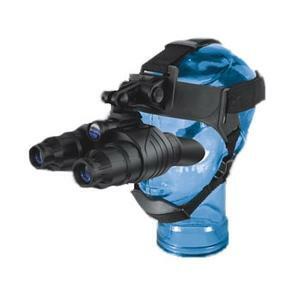 The device comes with a Head Mount and can be used as goggles. The Edge night vision binoculars are easy in operation. The device and IR illuminator are switched by pressing buttons (ON and IR respectively) located on the upper surface of the binocular’s body. Additionally, the Edge binoculars are equipped with a gradual IR illuminator power adjustment function. The wheel-shaped power controller is located next to the IR illuminator activation button. For more information see page Accessories. The housing of metal and plastic ensures extra durability and reliability during usage. Edge has an IP44 degree of protection (IEC 60529), i.e. this device is protected against water and dust which increases the range of its usage. At the core of the Edge GS line is the unique combination of specially designed R-Contact optics and the CF-Super Image Intensifier Tube, which provides the highest edge-to-edge resolution performance ever seen in a budget consumer NV product.